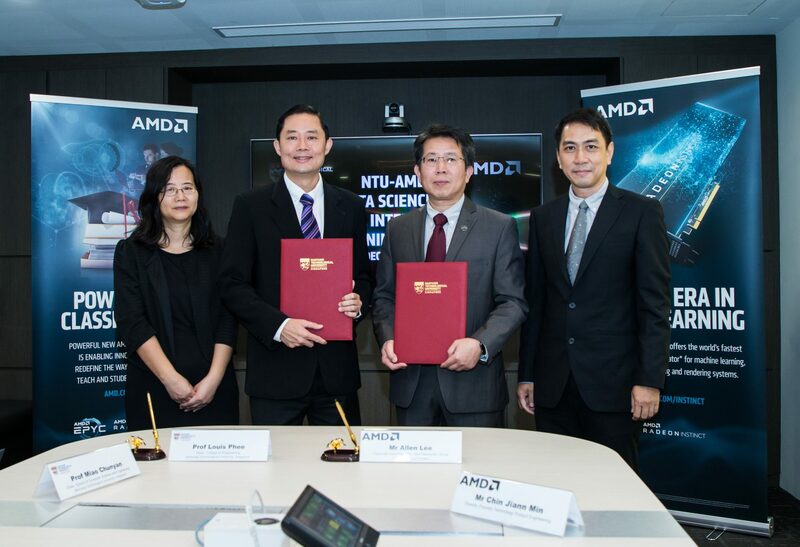 SINGAPORE – Friday, 14 December 2018 – AMD (NASDAQ: AMD) and Nanyang Technological University, Singapore (NTU Singapore) have joined forces to launch a Data Science and Artificial Intelligence Lab, which will nurture next-generation tech leaders equipped with the latest industry-driven digital skills. The S$4.8 million joint Data Science and AI Lab will leverage AMD’s deep-learning technologies and NTU’s global strengths in machine learning, artificial intelligence (AI) and data science, to complement the university’s Data Science and Artificial Intelligence undergraduate programme. NTU students will be exposed to real world applications such as developing software algorithms used in security fields like identification and motion detection. They will also work on big data and analytics which are now frequently used by leading organisations. For example, students will get opportunities to develop clinical support solutions using big data analysis to aid medical diagnosis. Students will also undergo training to participate in supercomputing competitions using AMD’s versatile open source software, Radeon Open Compute (ROCm) platform. This software facilitates ultrascale or hyperscale computing, a form of high-performance computing that can simulate complex systems within just a few days where it typically used to take years. Potential research projects and real-world machine learning and deep learning applications that students are expected to work with in the lab will leverage AMD’s open software platform for accelerated computing. For example, with the ROCm open software platform, Tensorflow (open source machine learning framework) users will benefit from graphics processing unit (GPU) acceleration and a more robust open source machine learning ecosystem. The collaboration will also provide NTU students with local and overseas attachment opportunities with AMD. From the next academic year in 2019, NTU undergraduates will be able to intern at AMD’s Shanghai Research and Development Center (SRDC) and the Singapore Product Development Center (SPDC). NTU will also support AMD’s engineers who wish to pursue PhD programmes through EDB’s Industrial Post-graduate Programme (IPP). “The philosophy behind AMD’s open source deep-learning architecture is about flexibility and choice – for developers and academics to have a range of hardware vendor-agnostic tools to innovate at scale. NTU is the premier institution for artificial intelligence, and we’re very excited to bring our technologies to empower the participating students to freely explore the diversity of deep-learning applications,” said Allen Lee, Corporate Vice President for Asia Datacenter Group, General Manager for China R&D Center, AMD. AMD will provide one instance of AMD’s current generation of server processor (EPYC) and Radeon Instinct MI25 accelerator that can be scaled to handle hyperscale workloads to start. AMD plans to provide the university with its latest server technologies, such as the Radeon Instinct MI60 accelerators in 2019 and beyond. AMD’s AI and machine learning experts will work closely with NTU professors to conduct joint training and workshop sessions for industry members. The collaboration will also support Singapore’s digital initiatives such as the AI.SG programme and support the nation’s transition into industry 4.0. “The establishment of the AI and Data Science Lab between AMD and NTU today is a great example of how industry and academia can leverage transformative technologies like AI to develop real-world solutions. This partnership is testament to the company’s confidence in Singapore and the innovation cluster we have here. Such an effort will also deepen Singapore’s talent pool for AI, and provide Singaporeans with the necessary skillset to participate in the opportunities that rapid technological adoption is bringing,” said Mr. Ling Yuan Chun, Deputy Director, Semiconductors, Singapore Economic Development Board.